You can also try just making a draw plate by drillling a hole the size of the dowel you want to make in a piece of steel plate. You then just take a slightly larger dowel, sharpen the end and hammer it through the hole. I do not think you will be able to hammer a 3/32” dowel. It is too small for that. How much do you need and of what species. I may be able to help. When I need dowels like that I use bamboo kabob skewers. It depends what you are using them for. I’ve been using bamboo kabob skewers as drawbore pins for years! Found in the camping equipment at Wal-Mart … just can’t beat 3600+ drawbore pins for $1.88. That’s why they make sandpaper … LOL! That s why they make sandpaper … LOL! Mike – I was going to mention the hand drill as you did above, but I did not want to break character by suggesting the use of a power tool … LOL! 1/8 by 36 is easy to get…. should be simple with either sanding or a dowel plate to get that 1/32 in diameter taken off. From Woodpeckers – 25 pieces 36” long is 12 bucks. Spent the afternoon working on this. Not remarkable success. Got some pieces pretty good about 12” long in stringy Kentucky Coffee Bean but not in a beautiful straight grained poplar. Have to move on to other projects but the challenge still remains. I’ll dig out the maple and machine up some ash but after these $ projects are done. I have tried all the methods mentioned if t&j sells it they must be affable . im looking for the mfg. I studied machines that make round pointy toothpicks, but didn’t get much help there. It’s going to take a pretty special setup to mass produce something that small. 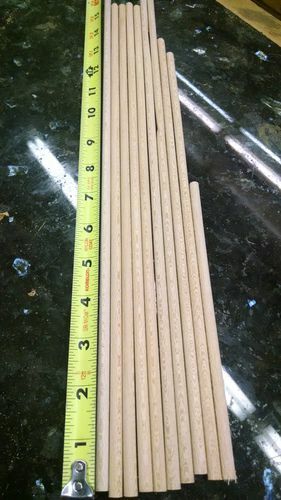 The few wood fibers in 3/32” are very weak. I even tried hedge using all the techniques of simple dowel making. I haven’t tried custom molding heads and have been reluctant to go down that path because the results are seldom round. Making them round involves the same challenges as cutting them from square stock, or even oversized rounds. Draw plates can make roundy things, but not straight things, and being this tiny the wood is not strong enough to draw. On the agenda to try is a BEALL type router jig that mimics pencil sharpener action. My most successful attempts at long pieces involved a belt sander, but again a very special jig would be needed that I don’t have time for right now. But tiny dowels have been floating around in my head for a long time, just because of the challenge to make them. If you find a mfr, I’d sure like to know how they do it. If you have a wood stretcher it’s easy, just start with a larger dowel and stretch it to the desired dia. Cut some 1/4” sycamore dowels today. Anybody want some?